The new Armenia listing in the Michel catalogue (see previous Blog post) gives separate prices for used stamps in the Dashnak period, but they are prices for CTO copies. A note simply indicates the scarcity of postally used material, and its rarity for anything used outside Erivan and Alexandropol. There are two problems about postally used Armenian material: finding it and identifying it correctly. 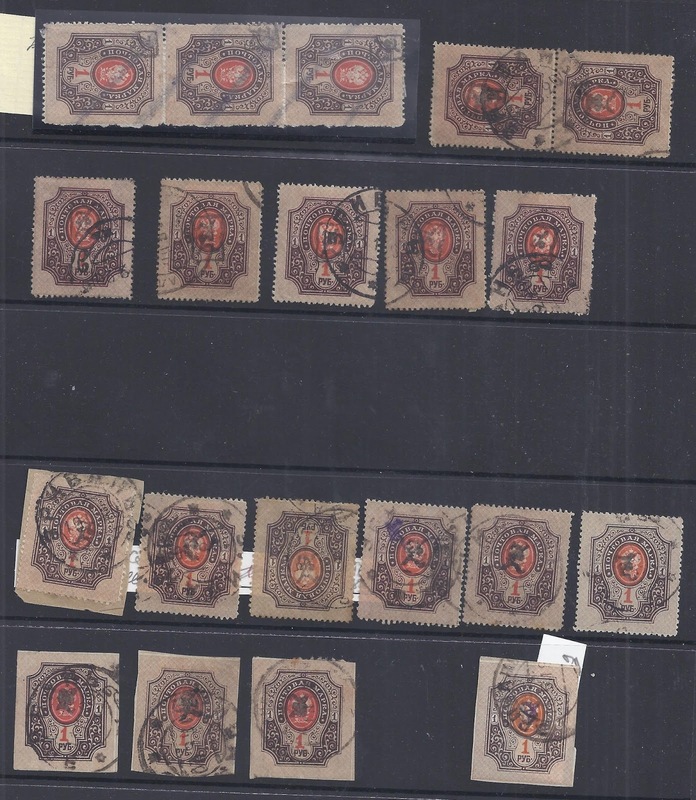 As for Danzig and other territories, if gum is washed off CTO stamps they often look very much like postally used stamps – especially where centrally placed cancels are applied. 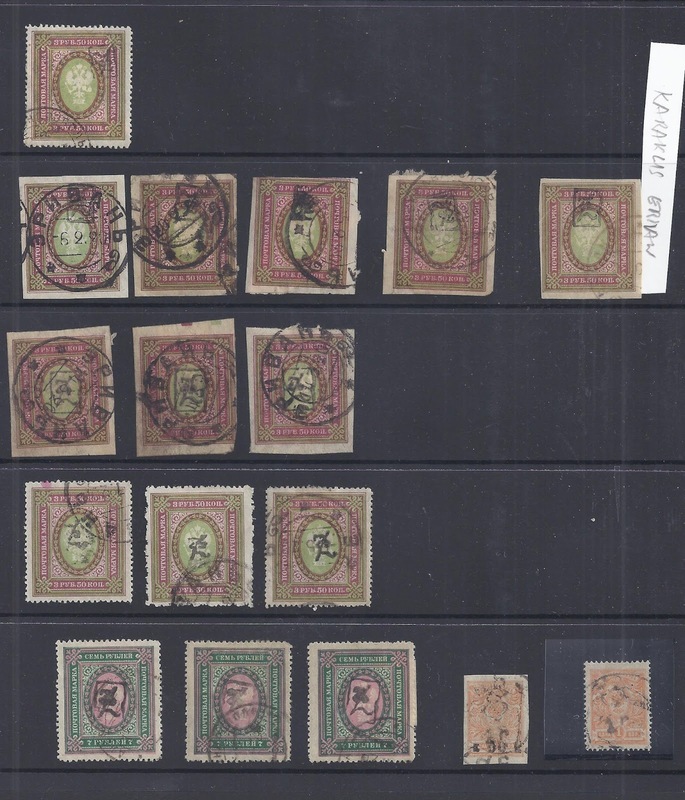 Worse, in some places dealers and collectors applied mint stamps singly to sheets of paper or blank envelopes and got them cancelled in bulk. But a single stamp when removed from its backing paper looks like a used stamp. This is true for all the Baltic countries after World War One and also for Armenia. Between 1917 and 1921 postal activity was often disrupted and some Armenian post offices disappeared forever: those in the areas of eastern Anatolia taken by Turkey (all of the Kars district, notably). Alexandropol was occupied by Turkey for a period. Conflict with Georgia disrupted the postal service. It wasn’t always possible to get the trains to run. Civil conflict, famine and disease were more or less permanent features of Armenian life. Postal activity was modest. The practice which was standard at least until 1939 of soaking stamps off covers makes it seem even more modest than it was. 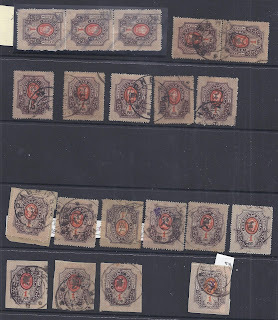 In addition, a significant part of internal Armenian mail would have been stampless official correspondence of which little survives which has not been faked by the addition of genuine stamps cancelled with fake handstamps. But even those fakes provide useful information. Erivan could not always maintain contact with other post offices. It did not always supply them with stamps so cash payments were accepted – this became official policy in the transitional year 1921 (Zakiyan’s research). Conversely, those post offices could not always get things into the postal network even if they were open and a clerk on duty. But the post offices were always there and the best evidence for that is the rapid revival of the internal post in 1922 – 1923 where old Imperial cancellations suddenly re-appear on the new Soviet Armenian issues, sometimes very dirty and worn (BASARGECHAR a good example). A significant part of franked mail in the Dashnak period was foreign mail destined for the Allied countries – the USA, France and Great Britain – who were providing some minimal support to the new Armenian republic and sometimes helped the mail along its way, as the British did in Batum. 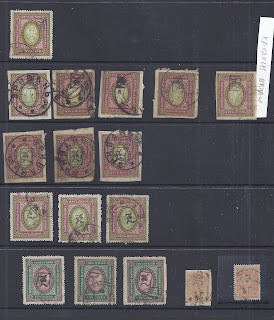 Those covers often had stamps soaked off and that is one reason that when I try to assemble examples of postally used stamps, it is the higher values which are more common. See the scans below. Tariffs during 1920 rose through rouble steps: 2 and 4 and 8 roubles. But mail abroad seems to have reduced and even stopped before the end of 1920 – postally used examples of rouble overprinted stamps are rare. There are only two examples on my scans (both of 1 rouble overprints). Inland mail from Erivan or Alexandropol probably had a poor delivery and survival rate. In addition, though stamps may have gone into Armenian collections, they did not leave the country once Soviet control was established. This is probably why I can show so few kopeck value stamps which would have made up tariffs of 30 and 60 kopecks and 1 ruble 20. The stamps on the scans are ones I think probably or certainly postally used, though I cannot tell whether they were originally on philatelic covers which (for example) Souren Serebrakian sent in quantity to his brother in Tiflis. 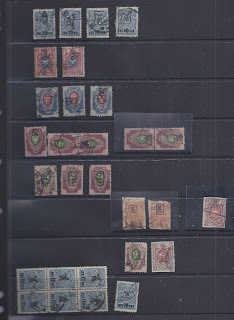 In sorting the stamps which are shown, I have looked at such things as paper adhering to the back of the stamp, careless cutting of imperforate stamps and even hand tearing, smudged postmarks which don’t look like the usual CTO. In among all the Erivan and some Alexandropol cancels, you will see a couple of manuscript cancels and just one identifiable as from another town, Karaklis, flagged up on a 3 rouble 50 kop imperforate.